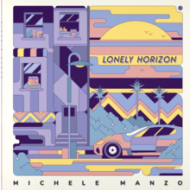 Manzo’s Lonely Horizon was produced in his Italian studio and mastered by the legendary Dave Cooley of Elysian Masters in Los Angeles (J Dilla - Donuts, Madvillain, Blood Orange). With brilliant features from long respected Brooklyn MC J-Live and Mo’Funk Records resident boogie queen Moniquea, This 8 track vinyl is a must have for groove hounds, dance floor junkies and perpetual chillers alike. In mid march of 2018 Manzo will be touring with UK soul staple Omar in promotion of Lonely Horizon’s record store day release. Two additional Italian vocal edits are included on the cassette recording as bonus tracks. Complete with exciting custom artwork by Lucas Saenger with an aesthetic that fits the sounds so closely that the lines between your visual and audio experience may feel blurred. Don't stress though, you’re just drunk on the funk.